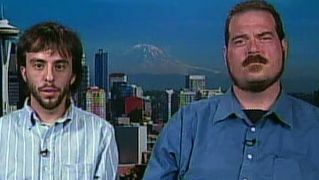 Christopher Pyle, Whistleblower Who Sparked Church Hearings of 1970s, on Military Spying of Olympia Peace Activists | Democracy Now! teaches constitutional law and civil liberties at Mount Holyoke College in South Hadley, Massachusetts. In 1970, as a captain in Army intelligence, he disclosed the military’s surveillance of civilian groups. He went on to work for Senator Sam Ervin’s Subcommittee on Constitutional Rights and Senator Frank Church’s Select Committee on Intelligence. He is the author of four books; his most recent is Getting Away with Torture. Amy Goodman's column: "Obama’s Military Is Spying on U.S. Peace Groups"
AMY GOODMAN: We turn to a follow-up on our exclusive broadcast yesterday. We spent the hour looking at a story out of Olympia, Washington, where antiwar activists exposed Army spying and infiltration of their groups, as well as intelligence gathering by the Air Force, the federal Capitol Police and the Coast Guard. Declassified documents obtained by the activists revealed that an active member of Students for a Democratic Society and Port Militarization Resistance in Washington state was actually an informant for the US military. The man everyone knew as “John Jacob” was in fact John Towery, a member of the Force Protection Service at Fort Lewis. The infiltration appears to be in direct violation of the Posse Comitatus Act preventing US military deployment for domestic law enforcement and may strengthen congressional demands for a full-scale investigation of US intelligence activities, like the Church Committee hearings of the ’70s. Well, Christopher Pyle was a captain in Army intelligence in 1970, when he first disclosed the military’s widespread surveillance of civilian groups. The disclosure triggered fifty congressional inquiries within a month. Pyle went on to work for Senator Sam Ervin’s Subcommittee on Constitutional Rights and Senator Frank Church’s Select Committee on Intelligence, that led to the founding of the Foreign Intelligence Surveillance Act. Christopher Pyle joins us now from Chicopee, Massachusetts. He teaches constitutional law and civil liberties at Mount Holyoke College, and he’s the author of four books. His most recent is called Getting Away with Torture. CHRISTOPHER PYLE: Good morning, Amy. AMY GOODMAN: I wanted you to first start off by talking about the significance of these revelations yesterday, with the young activists on Democracy Now! having simply applied under Freedom of Information Act [ed: public records request] for any information on anarchists or on their organizations in Olympia, Washington, and finding this one email inside that referred to this man named John Towery. They started doing some digging, and they realized it was their friend. Well, they knew him as “John Jacob.” He came out of Fort Lewis base. Christopher Pyle, the significance of this? CHRISTOPHER PYLE: I think the significance is less that the Army is monitoring civilian political activity than that there is a network, a nationwide network, of fusion centers, these state police intelligence units, these municipal police intelligence units, that bring together the services of the military, of police, and even private corporations to share information about alleged terrorist groups in cities throughout the country. I was fascinated by the story of the Air Force officer from New Jersey making an inquiry to the police in the state of Washington about this group. This is an enormous network. It’s funded by the Homeland Security Department. Police departments get a great deal of money to set up these intelligence units. And they monitor, largely, lawful political activity, in violation of the First Amendment and, when the military is involved, in violation of the Posse Comitatus Act. AMY GOODMAN: I wanted to play just two clips from yesterday. This is one of the activists in Olympia who exposed that his friend John Jacob was actually John Towery, a military informant and a member of the Force Protection Service at Fort Lewis. I asked Brendan Maslauskas Dunn, the Olympia activist with Students for a Democratic Society and Port Militarization Resistance, what his first reaction was when he found out. AMY GOODMAN: Brendan Maslauskas Dunn went on to describe exactly what his so-called friend, John Towery, said when he confronted him with the evidence. BRENDAN MASLAUSKAS DUNN: He admitted that, yes, he did in fact spy on us. He did in fact infiltrate us. He admitted that he did pass on information to an intelligence network, which, as you mentioned earlier, was composed of dozens of law enforcement agencies, ranging from municipal to county to state to regional, and several federal agencies, including Immigration Customs Enforcement, Joint Terrorism Task Force, FBI, Homeland Security, the Army in Fort Lewis. AMY GOODMAN: Brendan Maslauskas Dunn, the Olympia activist with Students for a Democratic Society and Port Militarization Resistance, the one who put in the Freedom of Information Act request [ed: public records request] and found out his friend, who he thought was named “John Jacob,” was John Towery out of Fort Lewis base in Washington state. Christopher Pyle, you’re now a professor. You were in military intelligence, a captain. When you started to uncover the military, what, almost forty years ago, investigating civilian groups, give us the history. CHRISTOPHER PYLE: Well, I was teaching law at the US Army Intelligence School, and I was asked to teach a class on CONUS intelligence and spot reports. CONUS is the acronym for continental United States. So I delivered a lecture about the need for the use of the military to put down riots, which did not require identifying any persons. You simply go in, clear the streets, declare a curfew, quiet things down, restore order. And an officer came up to me after class and said, “Captain Pyle, you don’t know much about this, do you?” And I said, “No.” And he said, “Well, I can arrange a briefing.” And he did. He took to me across the post to the headquarters of the US Army Intelligence Command’s CONUS Intelligence Section. There I discovered thirteen teletype machines reporting on every demonstration around the country of twenty people or more. The reports were coming from 1,500 Army plainclothes agents working out of 300 offices. They had it all covered. They showed me a mug book of persons who could be rounded up in case of a civil disturbance. The military really believed that if you had a civil disturbance or a protest, it was very important to know the names of the people who might be protesting, because, you never know, they might be connected with a cadre of agitators and communists behind them. Well, the same pattern is now developing under the Northern — the US Army’s Northern Command, which coordinates domestic intelligence work for the US Army and tries to prepare for what they call “military assistance to civil authorities.” It was out of this that the TALON reports came, but I also helped to disclose, reports on lawful, constitutionally protected antiwar activities. And so, history is repeating itself. AMY GOODMAN: Who were some of the people in the mug shots, Christopher Pyle? AMY GOODMAN: Who did they say could be rounded up? CHRISTOPHER PYLE: The first volume, under letter A, was Ralph David Abernathy, who was head of the Southern Christian Leadership Conference and a close associate of Dr. Martin Luther King. And there were many more of that type. CHRISTOPHER PYLE: Perfectly law-abiding citizens. AMY GOODMAN: So, you’re saying some protest happened somewhere, or a riot, and they can go to where Ralph David Abernathy is, in a wholly different place, and round him up. CHRISTOPHER PYLE: Yes, today, particularly, with the power of computers and internet communications and monitoring the public airwaves, this network of seventy-two fusion centers, plus all of the subordinate groups that provide information and seek information, can follow you and me and just about anybody all around the country. They don’t have to put transponders in our cars. They could use E-ZPass on the highway. But in your case from the state of Washington, they apparently used a transponder in an antiwar protester’s automobile. This is the kind of surveillance society this country does not need. AMY GOODMAN: Who else was listed at the time? CHRISTOPHER PYLE: Say that again? AMY GOODMAN: Who else was listed at the time, both individuals and organizations that you saw targeted? CHRISTOPHER PYLE: Well, one of the printouts that the military gave me of their surveillance for a particular week in 1968 included the infiltration of a Unitarian Church. In more recent years, surveillance of Quaker groups, the infiltration of Quaker groups in Florida, who were planning to protest military recruitment in their local high school. These are the people who, according to the TALON reports, are considered to be potential threats to military security. AMY GOODMAN: And explain what you mean by TALON. CHRISTOPHER PYLE: TALON is a collection of intelligence reports of threats to military bases that were collected by an unknown group for many years after 9/11 called the Counterintelligence Field Activity. It had a thousand employees. It was located in the Pentagon. And it was monitoring civil disturbances around the country, following a pattern very much like the 1960s and ’70s. The idea was that if you could follow enough protesters in the — protests in the country, or enough disturbances, you could tell when the country was going to overheat and the military would have to be called in. In the 1960s, they thought that if they could tell how many protests there were on college campuses, they could then predict riots in the black ghettos of the major cities of the United States. It was ludicrous intelligence work, but that’s what they had in mind. AMY GOODMAN: So, you left there that day, saying you were going to write an article. You were going to expose this. You learned about huge databases, places like in — where? In Baltimore, Maryland. CHRISTOPHER PYLE: Well, a big center was in Baltimore, Maryland, and — but there were six other computer databanks back then. Computers were still in their infancy. They were still being fed with computer punch cards. Nothing like we have today. They were bush league compared to what now exists in these fusion centers, that you’ve reported on, from the state of Washington. AMY GOODMAN: And what happened as a result of this information? You’re a military intelligence captain. You’re appalled by what you see: the targeting of civilians. You write an article. What ensued? CHRISTOPHER PYLE: Well, what was really interesting is I began to hear from my former students, who had been doing this work on active duty. And I eventually recruited 125 counterintelligence agents to tell what they knew about the domestic intelligence operations of the US Army. I shared this information with the press and with congressional committees. Senator Ervin, in the Subcommittee on Constitutional Rights, held hearings, which I organized and disclosed the existence of this system. The military was embarrassed by the system and eventually disbanded it and burned all the records. I checked on that by interviewing the guys who did the burning of the records. AMY GOODMAN: There’s a discussion right now among the people who are involved — Congress member Barbara Lee; in New Jersey, Rush Holt, congressman; chair of the Judiciary Committee, Conyers — weighing a committee be set up to once again investigate, as the Church Committee did, intelligence in this country and its far-reaching effects. For example, the example we brought out yesterday of the military infiltrating peace groups, and this was just one individual that we looked at. Talk about what came from the Ervin and the Church Committee hearings. CHRISTOPHER PYLE: Well, the Church Committee did the most extensive investigation of all the agencies. Ervin’s committee just did Army intelligence. But nobody had ever done anything to investigate intelligence agencies before Senator Ervin took it upon himself to do so. Once Ervin proved that there was extensive misconduct and abuse of authority, then others got interested. And the House created a committee under Otis Pike, and the Senate created a special committee under Frank Church. They had to create special committees, because there were no standing committees to oversee the intelligence agencies. And as the result of the work of those two committees, we now have standing congressional committees whose job is supposed to be to oversee the work of the intelligence committees. So the proposal for yet another select committee to do the work of existing committees seems to me a political nonstarter, but maybe Barbara Lee knows something more about the politics of Capitol Hill than I do. AMY GOODMAN: What do you think needs to be done right now? CHRISTOPHER PYLE: I think that we need to prosecute the torturers. I think that’s the biggest single message that we could give to the intelligence community, that it is not above the law. That’s even more important than the domestic intelligence, and the domestic intelligence, to me, is extremely important. That’s the untold story that you’ve begun to tell, but there have been many other abuses of authority. And when you get into torture, kidnapping, secret illegal detention and assassination, it seems to me you’ve gone over the hill to the most serious abuses any intelligence community can possibly commit, and that’s the place to start. Don’t lose our focus on that. And then, after that, we need to investigate ways of curbing domestic intelligence activity. And there’s an area of this which has not yet become publicly known, and that is the role of corporations working with the intelligence agencies, corporations which do data processing and data mining, which are totally exempt from any state or federal privacy laws. There’s no control on them at all. And when they’re part of this network, they can use Google and techniques like Google, sophisticated techniques, to gather a great deal of information on the personal lives of the young men you had on your program yesterday.
. Christopher Pyle was a military intelligence captain when he exposed the surveillance of civilian groups in this country, now a professor at Mount Holyoke College. Thank you for being with us.